Both of the first two movesets require a setup. First use loads the cannon. Second use fires the cannon. This pet would be more useful if you could use them in tandem, for example the way a Rocket Bot can use Launch Rocket. That way if your canon died and another one came in or got switched in place, it could take advantage of that second move, like a Clockwork Rocket Bot can do with Launch Rocket. If this were implemented, the Pocket Canon would be pretty good instead of mediocre. Got this awesome new pet today! So excited to see how he does in battle! Waited three weeks to cash in my 3 Old Bottle Caps for this beaut - totally worth! 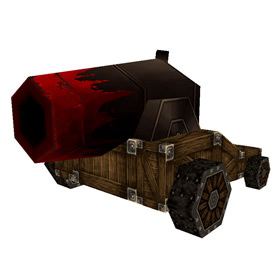 Showcasing an enlarged and blood-splattered cannon on the first day possible. Even the number one collector doesn't have this pet yet. It is da bomb. Ba-BOOM!! Mr. Smite kept this in his trunk, but always seemed to prefer his hammer. Seems like a mistake in hindsight.